I'm new round here "cycleman" (chris) pointed me in the dircetion of the forum after I got talking to him on the train following my Abingdon to London ride earlier in april. Please forgive me if this isnt in the right section, if there is a better place to put it do let me know. Waffle over, the front brakes have been really winding me up lately. they are old sturmey archer centre-pivot items as pictured. 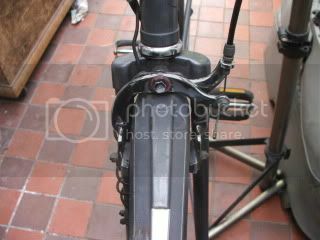 The front set are not centering properly, ie, the pad on the right (as you look at it in the picture) constantly rubs on the rim, often causing the brakes and the bike to judder violently. when the lever is pulled, only the left pad/lever moves instead of them both moving inwards to grip the rim. Not long after I got the bike I dismantled, cleaned, and lubricated all the moving parts of both brakes. The problem has only developed recently. I have tried dismantling them and adjusting them again but to no avail. Hi David. I'd be looking at the cable next to see if that's dragging the R/H brake into the rim. Does the brake centre up if you disconnect the cable. They're infuriating to get right, aren't they. BTW - you'll get more responses if you move your post to "The Knowledge" as this is a low-traffic part of the forum. The problem of pulling is very common on these brakes and always has been. Take a hammer and screwdriver. Place the screwdriver on the spring close to the pivot bolt on the side where the brake block is furthest from the rim . Give the screwdriver a gentle tap with hammer until the brake blocks are equidistant from the rim. This will solve the problem of the uneven pulling but not permanently. Squeeling could well be solved by toeing in the blocks. Take a screwdriver. Probably a Phillip's one this time. insert it into the slot the block goes in and gently lever until the front of the block touches the rim just before the rear of the block. Ive got a 1981 Raleigh Record Ace and it had similar brakes to yours and similar problems, even in perfect working condition these brakes are still crap compared to modern kit, so ive ditched them and fitted Shimano R650 dual pivot brakes,took a bit of doing but talk about improvement, a 30 year old bike can now stop every bit as good as my 2006 Scott CR1, cost me 70 quid but now i know i can stop the thing i,ll use it a lot more now. Was a good review of brake sets in recent Cycling plus and some of the cheaper sets came out very well. I have side pull brakes on my old Raleigh Scorpio and what I do to get the blocks equal distance is to turn with an allen key the nut on the back of forks that fixes the caliper. This twists the caliper and seems to apply more spring pressure to one or other side evening out the actual brake block movement. If you are doing what I think you are doing, which is slightly loosening the nut attaching the brake to the fork, this is a seriously bad idea. My experience is those Allen nuts need no assistance in coming undone and the consequences are not pretty. I've just had a look at a couple of brakes and a couple have flats on the central axle in front of the fork which can be rotated with something like a thin cone spanner. (Mine is the Park Tools OBW-3 and is 14mm) Old Weinmann brakes used to have a hexagonal boss sticking out in front which needed a small L- shaped box spanner. At the end of the day, when all's said and done, there's usually a lot more said than done. 1. Side pull brakes are crap. They will not stop you efficiently, and they are almost impossible to centre effectively. a. Ensure your cables are not draggy, and replace them very regularly. g. Remove, discard, and fit proper brakes. 3. Side pull brakes are crap. Better than centrepulls and better than rod or spoon brakes. But it's still more effective to slow yourself down by blowing hard. There are such thing as decent sidepull brakes* (AKA single-pivot calipers) that do some braking and can be centred ok, but these are unlikely to be found on an old Raleigh bike in a skip. Look into fitting modern dual-pivot brakes. Second-hand ones can be quite cheap. * I have one on the back of my "racer" to save weight. I wouldn't use one as a front brake.